1. The basic horizontally polarized antenna is a half-wave dipole. It has a radiation pattern that exhibits lobes and sharp nulls. The impedance at its feed point is 75 ohms in free space. 2. In order to obtain a horizontally polarized antenna that radiates almost equally in all directions, we may bend the half-wave dipole to form an open circular loop. This configuration is known as an HO loop or halo antenna. Its impedance at the feed point is about 12 ohms in free space. The halo antenna requires a device such as a gamma match to efficiently couple its low impedance to 50 ohm coaxial cable. There is high RF voltage across the open ends of the halo loop, and these must not touch each other. 3. I used a 112 inch (284 cm) long piece of 1/2 inch (12.5 mm) soft aluminum tubing coil to make the halo antenna. I formed the aluminum tubing into an open loop of 37 inch (94 cm) diameter. 4. 50 MHz Halo Antenna - omnidirectional horizontally polarized. 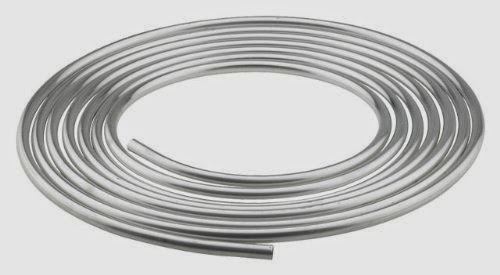 The full sized halo loop is 112 inches or 284 cm (37 inch or 94 cm diameter) of 1/2 inch (12.5 mm) soft aluminum tubing coil. The gamma match rod is 18 inches (46 cm) of 12 AWG solid copper wire spaced 1.5 inches (3.8 cm) from the halo loop and with a shorting clip at 13.5 inches (34.3 cm). The supporting boom is 1/2 inch (12.5 mm) Schedule 40 PVC conduit. 5. Another view of the 50 MHz Halo Antenna. 6. Close up view of the feed point - SO-239 receptacle and center point of halo loop are secured to the boom with hose clamps. An Arco 466 mica compression trimmer capacitor 105-480 pF is soldered between the center pin of the SO-239 and the gamma match rod. 7. Close up view of the feed point - SO-239 receptacle and center point of halo loop are secured to the boom with hose clamps. An Arco 466 mica compression trimmer capacitor 105-480 pF is soldered between the center pin of the SO-239 and the gamma match rod. 8. Close up view of the feed point - SO-239 receptacle and center point of halo loop are secured to the boom with hose clamps. An Arco 466 mica compression trimmer capacitor 105-480 pF is soldered between the center pin of the SO-239 and the gamma match rod. 9. Side view of the feed point. A BNC to UHF adapter is on this SO-239 receptacle. 10. Another view of the feed point. A BNC to UHF adapter is on this SO-239 receptacle. 11. An alligator clip serves as a temporary shorting bar. The capacitance and the position of the shorting bar are adjusted alternately until a 50 ohm non-reactive impedance is achieved at the feed point (1:1 standing wave ratio). This occurred at 13.5 inches (34.3 cm) from the feed point on my antenna. 12. A split bolt connector soldered to the shorting bar replaces the alligator clip for a durable adjustable connection to the gamma match rod. Tuning the antenna requires three adjustments: the gap space, the shorting bar location and the capacitor, and these all interact. Set the capacitor at mid range and the shorting bar about 12 inches from feed point. Adjust the open end gap for lowest SWR at 50.3 MHz (or your desired center frequency). Alternately adjust the capacitor and move the shorting bar position for lowest SWR. Repeat steps 2 and 3 until finding the 'sweet spot' where 1:1 SWR is achieved at the center frequency. Tightly secure the shorting bar in place. Protect the feed point and capacitor preferably with a UV resistant cover. 13. The open ends of the halo loop are supported inside 3 inch (7.6 cm) lengths of PVC conduit on the Tee fitting. The one inch markings on the aluminum tubing indicate the gap distance which determines the resonant frequency. A gap distance of 2.5 inches (6.4 cm) yielded a resonant frequency of 50.3 MHz. Small sheet metal screws through the PVC secure the gap spacing. 14. Small sheet metal screws through the PVC secure the gap spacing between the open ends that determines the resonant frequency. 15. A disposable styrofoam beverage cup is cut to fit over the PVC boom and feed point with gamma match arm. 16. The disposable styrofoam beverage cup fit over the PVC boom and feed point with gamma match arm to protect it from the weather. A more durable UV resistant cover is preferable for long term use. 17. The homebrew 6 meter halo antenna was secured with a U-bolt atop a 10 foot (3 m) length of 1" (2.5 cm) Schedule 40 PVC pipe and mounted on the roof about 18 feet (6 m) above ground level for the 2014 ARRL VHF Sweepstakes contest. 18. The homebrew 6 meter halo antenna was secured with a U-bolt atop a 10 foot (3 m) length of 1" (2.5 cm) Schedule 40 PVC pipe and mounted on the roof about 18 feet (6 m) above ground level for the 2014 ARRL VHF Sweepstakes contest. 19. 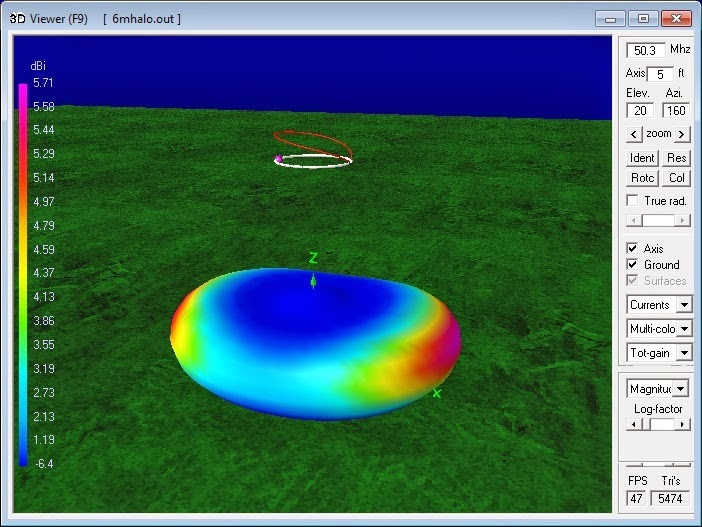 4nec2 Calculations for the 50 MHz Halo Antenna at 118 inches or 3 m (0.5 λ) above simulated ground. I used the high-pass L-network tool to simulate the gamma match to match for 50 ohms impedance. 20. 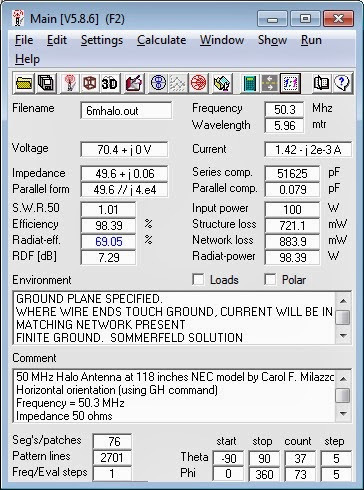 50 MHz Halo Antenna model - 4nec2 calculated standing wave ratio over 49.5 - 51.5 MHz. The 2:1 SWR bandwidth is 1 MHz from 49.8 to 50.8 MHz. 21. For comparison - a shortened 80 inch circumference halo antenna with a 3 pF loading capacitor across the gap (similar to Hi-Par Saturn 6 antenna). Note that the 2:1 SWR bandwidth has decreased to 300 kHz. 22. 50 MHz Halo Antenna prototype - Standing wave ratio and Return Loss over 49.5 - 51.5 MHz measured with miniVNA Pro. This full size halo antenna provides a 2:1 SWR bandwidth of 1 MHz. 23. 50 MHz Halo Antenna prototype - Resistance and Reactance over 49.5 - 51.5 MHz measured with miniVNA Pro. 24. 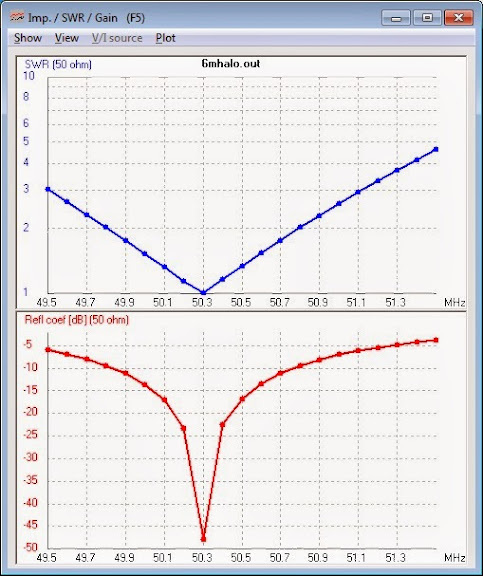 50 MHz Halo Antenna prototype - Impedance and Phase shift over 49.5 - 51.5 MHz measured with miniVNA Pro. 25. 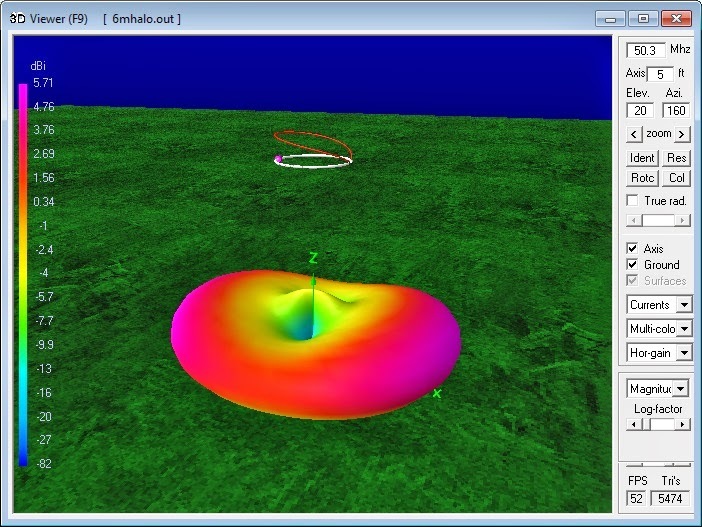 50 MHz Halo Antenna 4nec2 model - Three dimensional view of the antenna current and radiation pattern at 118 inches or 3 m (1/2 wavelength) height above simulated good ground. 26. 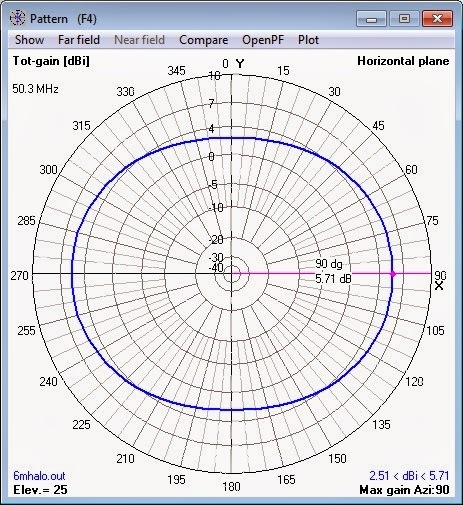 50 MHz Halo Antenna model - 4nec2 azimuth radiation pattern at 118 inches or 3 m (1/2 wavelength) height above simulated good ground. 27. 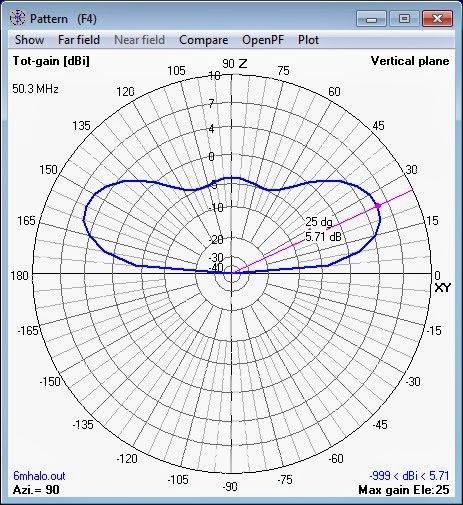 50 MHz Halo Antenna model - 4nec2 elevation radiation pattern at 118 inches or 3 m (1/2 wavelength) height above simulated good ground.